Parents are also worried about the career options for their children that will set a good platform for them to become successful in life. There are numerous career options to select from. But, you wish to select the best for yourself. So, here we shall be discussing about career in commerce i.e. career options for commerce students only. Courses after 12th Commerce: How to Choose? You can’t define one single best course for yourself. There are a number of degrees and professional courses to choose from. What matters is the one that you choose and prove it to be the best for yourself. Making the right career choice is a major decision of one’s life. Sometimes it is a bit confusing. So, follow your interests and go ahead with what makes you feel happy. You became familiar with a whole range of commerce subjects in class 11. Not only this, you further broadened your horizon by studying interesting commerce subjects in 12th class. Therefore, once you pass 12th Commerce, you need to select in which direction you should move ahead. Taking the right decision is just a stepping stone for building a successful career in the commerce field. You have to put in the best of your efforts to achieve your dreams. So, if you are aware of your interests and which way you exactly want to go, things might seem a bit easy. Here is a list of some of the main courses that commerce students can pursue after their 12th Commerce standard. This is not in any particular order, you can go through this massive list and make a choice based on your specific interests. We have tried to cover a few major career options for commerce students. This is the general degree that spans over a period of 3 years that you can pursue after completing your 12th commerce. Having a normal B.com degree proves quite handy even if you are pursuing any of the professional courses. It is always beneficial to complete your graduation that may help you later on if you go for higher studies. You can pursue B.Com as a full time course or through correspondence depending upon your choice. Distance education courses or correspondence courses are beneficial if you are also pursuing a professional course like CA, CS etc. Otherwise a regular degree is a better choice. This is similar to B.com but in an extensive form with specialisation in a particular subject or field like Accountancy, management or economics etc. The industry demand for B.com (Honours) is somewhat better than normal B.com. However,the admission criteria and eligibility conditions might be similar for both. These may slightly vary for different universities/colleges. ALSO READ Peer to Peer Lending in India-Facts to Know! This is yet another option for commerce students to pursue after their higher secondary education. You will get to experience practical knowledge on various economic concepts, economic policies, analytical methods and programs etc. If you are keenly interested in economics and want to gain specialisation about the economic framework, this might suit you. This is a 3 year Business administration course helping to build a base in core business disciplines. You get to explore different functional areas of a business environment. So, if you are interested in getting an exposure to the various business aspects and get a hold of the concepts of business administration, this course might be your choice. Another undergraduate programme designed to prepare students in the field of management. This is a 3 year course that provides theoretical and practical training which helps to inculcate leadership and managerial skills. A good understanding of managerial practices and concepts can guide you to explore ample of opportunities in the business world. You get to learn and add varied knowledge in the field of management, human resources, organisational theories, research methodology etc. The demand for skilled managerial professionals has seen an increasing trend. So, having the requisite degree from a reputed institution can help you to become successful in the corporate world. Some colleges might have renamed their BBA Course as BMS Course. So, don’t get confused and just clarify all the details beforehand from the respective college. Please note that semester system is being followed for most of the Bachelors and Masters degrees these days. Hence, check out all the relevant course details, fees, duration and other important aspects from the respective colleges/universities. This is the best professional course for building a successful career in commerce. Becoming a Chartered Accountant opens the various doors to exciting career opportunities in diversified sectors. You can act as a Tax Consultant, an auditor, an advisor, a financial officer and so. This entirely depends upon whether you go in your own independent practice or you settle for a corporate job. No doubt, CA requires lot of hard work and sincere efforts to enter this esteemed profession. It might be easy for CA entrants to clear the initial level. But, the higher levels you reach i.e. Intermediate (IPCC) and CA Finals, the tougher it gets. So, complete determination followed by consistent efforts are the keys to success. The new curriculum has been launched for CA Course wherein you need to do Foundation, Intermediate and Final levels. This professional course is provided by The Institute of Chartered Accountants of India (ICAI). Its Head office is in New Delhi, branches are located all over India. You can visit the official website www.icai.org to get deeper insights on the course, eligibility conditions and admission procedure. This a well known course promising rewarding career in the field of accounting, taxation, auditing, financial reporting to name a few. The theoretical knowledge alongwith the practical training (articleship) that you get helps to build a name and respectable position for yourself. If you wish to pursue the CA course, you may like to know: How to become a Chartered Accountant or CA? This is another professional course that is opted by students after 12th commerce. This course is provided by The Institute of Company Secretaries of India. A Company Secretary is basically responsible for all the regulatory compliance of the company and acts as an in-house legal expert. After doing CS you have an option to practice independently or look in for a job in the corporate world. This course is provided by The Institute of Cost Accountants of India or ICWAI. Certified Cost Accountants maintain cost accounting records, do cost auditing, helps in planning, controlling and costing of products. You can do your own practice as CMA or hold managerial positions in public as well as private enterprises. The role of Cost Accountant goes beyond that of Financial Accountant by helping in production operations and processes. You can chose the cost audit area, certification and consulting areas. Are you are interested in building a career in areas of Personal finance, wealth management, insurance planning, mutual fund investing? If yes, then this might be a great fit for you. So, if you want to enter the financial planning world, then you need to get this certification as a Certified Financial Planner or CFP. So, if you are thinking to become a financial planner helping people in their investment planning, tax planning, insurance, retirement planning, CFP is a must have. Now, these were just few of the major courses for commerce students that you can select from. There might be many others courses to look for. Like you can go in for some banking courses or prepare for UPSC or IAS if you are interested in doing so. We have focused only on finance, accountancy, taxation, law and related courses in this post. There are numerous other courses that a commerce student can pursue as per his preferences and interests. e.g. Students are interested in wildlife photography, fashion designing, hotel management, other creative fields etc. as we got feedback in our comment section. You just need to be confident, follow your passion and work hard to achieve success. If you have the zeal to do something different, you can checkout some of the Best Courses after 12th: Creative Career Options to look for! Having guidance from your elders and experienced persons really helps. In fact, good elderly advice is essential to guide you in your career path. But, the final decision should be taken by keeping in mind your own passion and interests. If you follow your passion and pursue what you like, the success path will become much smoother for you. You can anyways become successful in life if you take the right career decisions and enjoy your career path. Relax for now… and don’t miss to checkout some Exam specific books at Amazon.in and grab exciting deals and discounts thereon. This post contains affiliate links, we might be earning a commission if you purchase. Thanks for supporting our blogging adventures! Further, going abroad for higher studies is a common choice amongst students when they complete their 12th standard. If that’s your choice, you will need to checkout a list of courses after 12th commerce that you can pursue abroad. We shall be covering it in one of our upcoming posts. In the meantime, you may also like to scroll through our exclusive list of Courses after B.com: Best Career Options for Commerce students! Some of you might be quite passionate about learning business skills and developing a business attitude. For you, we have a massive list of 21 Best Business Books to read and help you guide your way. If you wish to add any details or share your own experiences on any other commerce courses after 12th for building a successful career in Commerce field. Feel free to share your valuable feedback. If you have any queries, you can ask in the comment section below! technological globe everything is accessible on net? Thanks for the great info. But all common people can’t access net. These days net facility is available in maximum areas.There may be few where you don’t have it. Anyways,I was just looking for some good courses in commerce field and came across this list.It is really helpful.Thanks for sharing. It depends on their comfort zone. Because newspaper are cheap and is easy to read.You don’t need any network, its on your door step. Its all in one.I don’t mean that net waste of time or money.But, both have their own importance. You are right bro but news paper don’t have all topics I mean each and every details. The best thing is that news paper have feels. You can touch it you can feel it and that page turning sound is real great. If you love this things than it’s beautiful or great for you. But, if you want to read news while walking or into market places than Technology is the best thing. People still find comfort in papers instead of mobile phones.It is beneficial for those who can’t afford internet. Everyone has their own personal wish, the way he or she wants to access any knowledgeable information. News papers (well known) usually publish reliable information and people are used to reading them. so, it’s just a matter of choice. i am rajat. i passed my class 12th in 2016 with 88 percent (top 4 commerce ) . The future seemed to bright after such marks. I got to know about a course ; CIMA (chartered institute of management accountent). and also i am persuing with the same along with COMPANIES SECERATORY and BCOM from SOL . As i was told the study of CIMA seemed to be very easy . but the story was different. i gave my first attempt in january after studying 6-8 months and unfortunatey i failed. till now i have given 2 more attempts ( 3 in total) for a single paper and i have to give 17 papers. sir i am in a problem as i have to select a professional course only . sir please suggest me as to what professional course sholud i persue with CS and BCOM. Hi Rajat, Firstly don’t be so disheartened.You got 88% in 12th commerce,that is really admirable.You are an intelligent guy,so there is no need to loose hope.You are already doing B.com and CS,thats a good choice. Regarding CIMA you have given 3 attempts only,professional courses like CIMA and CA are not so easy.It is quite normal for students to appear in multiple attempts while completing such courses and they still come out with flying colours.So,you should at least give a try again to CIMA. You have enrolled for it because you were interested in it,so just give it some more try before giving up.Look for your weak points,where you exactly lagged behind and try overcoming it. If you still wish to go for some other professional course,CA is a common choice alongwith CS that students usually go for.But,CA is also not so easy.You need to put in a lot of hard work and consistent efforts for it. Otherwise,if you don’t want to overburden yourself,you can firstly complete your CS and graduation and then go for MBA from a good institute.Your choice should basically depend on your own interests.Relax and decide which way you exactly want to move ahead. All the best ! Nice ! Thanks for the useful info on different courses. Hi, I completed plus two now. I am confused to choose a course. Can you suggest me a perfect course. Hey, I am Amar. I am an average student who is in class 12 . I get around 75% in my class.I am from commerce stream with maths.I want to do something in finance or law.I would like to know a little bit about investment banker and what are the professional degree options I have.Which examination I should start preparing while in class 12.Please guide. I am not so sure that why did you chose CIMA. I am a qualified CIMA with global third rank. You need to understand that each commerce course has a distinct specialisation and so you should not choose the course but the field you are interested in. If you want to go ahead in audit field, definitely you should choose CA or ACCA or CPA; if your interest is in equity research, CFA is a better choice. Please watch this video, it will guide you. I was thinking to choose CS. But, my friend is saying, it is a difficult course. So, what other good options after 12th can I choose? Any suggestions. Excellent article. The information will be useful and helpful. I’m not much good at maths and I am confused for which course should I go for after Syjc,I want to do Bms,law or learn accounting what should i go for. I can well understand your situation.This is a common confusion amongst students as to which course to pursue.Before taking a decision,the first and the foremost thing to do is to know your specific interests.What are your favourite subjects and what you actually want to become in future.Once you are clear on that,it will be easy for you to decide.What basically matters is your own interest in a particular area. We have already mentioned some of the popular courses in our article http://fintrakk.com/best-courses-after-12th-commerce/ Feel free to discuss for any queries. Can you advise me the best option for girls.I am really confused to choose a course.As u know the forms are out and now i m tensed.I hope u will understand my problem . I can well understand your situation.This is a common confusion amongst students as to which course to pursue after 12th class.You haven’t mentioned your stream, assuming that you are a commerce student since you landed on our article http://fintrakk.com/best-courses-after-12th-commerce/ we have already mentioned a list of few popular courses in our article. Before taking a decision,the first and the foremost thing to do is to know your specific interests.What are your favourite subjects and what you actually want to become in future.Once you are clear on that,it will be easy for you to decide.In the present world,girls are equally competent and can pursue any of the courses mentioned in our list.What basically matters is your own interest in a particular area. Feel free to discuss for any queries. My favourite subjects are Maths n Economics. I love commerce a lot but little confused what to do.So, I just want to ask u to guide me. Hello shewta, I think its depending on your marks and your own choice. Hello sir, Can u please suggest me d best course for girls .. I m now giving my board exams ….. as u know that the forms r out.Please suggest me a good course to choose and the best option which helps me to build my career and give success. You can join B Com, BBA or some Diploma which is job oriented. This is a good choice. Thanks for the info. Its really helpful to students. Hello,can you please tell How much money do we get in CMA and CS.Which one is easy CMA or CS. I can well understand your situation.This is a common confusion amongst students as to which course to pursue after 12th class.We have already mentioned a list of few popular courses in our article. Before taking a decision,the first and the foremost thing to do is to know your specific interests.What are your favourite subjects and what you actually want to become in future.Once you are clear on that,it will be easy for you to decide. Going through your details, you seem interested in doing CA but are scared looking at the pass percentage.This behaviour is pretty normal since a professional course like CA involves consistent efforts and a strong determination.But,with your hard work and regular studies you can clear it as well.If you pursue CA,you can complete your B.com alongwith it through correspondence.Check for yourself What your interests are and which career you want to choose. Feel free to discuss for any queries. CA usually takes 4 to 5 years, further there is no guarantee that you will pass the examination. This is not to discourage someone, however the result remains 5 to 10 % only. An average student can opt for B.Com graduation alongwith practical diploma course in accounting, finance or taxation. Can u please suggest me some valuable options,to give a perfect justice to my talent. I can well understand your situation.This is a common thing faced by students once they enter a professional course like CA.There is a lot of difference between what you studied and the way you studied earlier.In a professional course you need to be more specific towards your goals. * Studying and understanding things minutely. * In depth analysis of various topics. * Learning from your articleship experience. * Knowledge addition in the best possible manner,that will be a guiding map towards your success both in becoming a CA as well as in your life ahead. Try to develop a regular study routine.Relax for sometime if you feel stressed and then come back with extra efforts to achieve your goals.If you are opting for any coaching, just take it in such a way that you have ample of time for self study before your exam attempt. You are getting this reply from a CA who can well correlate to your situation 🙂 So,don’t be depressed, follow your passion and interests and climb the ladder of success. All the best ! You seem to be very talented. Please if you are really interested, then only enter CA. Even my situation is same as yours.. 85% in 10th.. in earlier days it was not best of five.. in 12th also above 80% grades, scored 160 in CPT and after that IPCC also cleared in first attempt.. that too above 400+, But at the end of the day its not worth… I am giving CA final since 2 years, many are still hanging in… If you have patience in you.. then only enter CA, because efforts are very huge.. but the rewards are not so Satisfactory. Whoever says any thing… But try to find out the reality yourself. So please take a wise decision… You can try MBA.. from IIM or any other reputed institutions.. or Even MPSC or UPSC.. Civil serivces exams,, Bank POs or even IBPS… But don’t ever try CA if you are not interested or you think that you would be fed up soon of this tight schedule. I am a Commerce student. I just gave my 10th and I am really confused should I opt maths for 11-12 since its pure maths and college has commercial maths. Please advice me on this and give me some career advice with and without maths of 11-12 .Does MBA,eco honours or A/c honours and CS needs pure maths. I had taken commerce with maths in my pre-university just because I thought it would be beneficial. My PU offered pure maths even for commerce students but we really just need basic math. So if you are good in basic math (probability, stats, factorisation etc) you’re good to go and just selecting marketing as your optional subject. Since taking pure math (the engineering math) can spoil your 12th percentage. I know this because its what happened with me. Had I taken marketing, I would have scored way better. Take your time and select carefully. You don’t really need to learn integrals/calculus for commerce. B.Sc(Economics),B.Sc(Hons)(Economics), BA(Economics),BA(Hons)(Economics) ,Bachelor in Economics. Further there are various options at graduation level like Applied economics and Business Economics fields etc. that can be selected as per your area of interest. These B.Sc and BA degrees are available in both general as well as an honours version( with specialisation in a particular subject). Kindly tell what is value of CFP Courses I listen first time about? Could clear it? CFP is Certified Financial Planner. If you have interest in financial planning and investment planning then CFP is a good choice. There is a lot of demand for financial planners these days. Hi, Can you recommend courses to do along with CFP as I am currently giving my boards. I am a commerce student with Maths and IT subject. Hello sir I am an average student…what to do after 12th commerce…I am confused ..please help…!! It primarily depends on your own interest as to which course to pursue after 12th.If you are looking for something basic, B.com or B.com (Honours) are two good options. Rest of the professional courses as mentioned in our list shall need some extra efforts on your part.Anyways,it does not matter if you are an average student, hard work and determination to complete a particular course is what matters the most.All the best ! My daughter entered in 12 std and is in commerce.We are confused in selecting a course after12 std.She is good in Maths and Accounts,so we decided to go for CA. Can u please tell When to start procedure and how to do preparation for CA course.Also,guide on coaching classes in Vileparle or Andheri for CA. Further,can u tell about the prospects of CA in future for her career. I’m a 12th student.I am sure that I’ll get more than 95℅ marks.I am thinking about doing a professional course.I have confusion among doing C.M.A and C.S.can u help me in taking decision? 1. CMA is tougher than CS. 2. CMA is good if you have interest in Cost accounting,cost of manufacturing,pricing of goods & services etc. 3. CS has a lot of theory subjects. 4. When you become CS, you are involved in creating policies of company,maintain legal records. You act as a mediator between management and Board of directors. These are just few points, the final choice has to be yours. While pursuing any of these courses,do complete your graduation also even if through correspondence. That may help you in future. Hi, I am Robin I completed my +2 studies in commerce batch and have only 50% so which course should I prefer.I am interested in accountancy and business studies. Sir, Can you tell some highly paid fields which I can do after 12th commerce! I have just given my Hsc board exams and I’m waiting for my results! Thanks in advance ! We have already mentioned some of the best courses for students to pursue after 12th commerce. Professional courses like CA,CS,CMA,Law can give you good opportunities in future. Regarding highly paid fields, it depends on various factors like where you get placed, you are in job or start your own practice, the city where you work and so on. Metro cities or other big cities and big companies/big firms offer higher packages as compared to what you might get in smaller cities. The main thing to be kept in mind is that your choice of course should be based on your own interest and what you like so that you enjoy your career path. All the best ! and if the matter is about efforts I’ll put my best in it. Please guide me related these? Its good to see your interest in joining CA course. * Learning from your articleship(training) experience. Try to develop a regular study routine.Since,you won’t be having any regular college, you need to focus and fix a study routine for yourself.Relax for sometime, if you feel stressed and then come back with extra efforts to achieve your goals.If you are opting for any coaching, just take it in such a way that you have ample of time for self study before your exam attempt. You are getting this reply from a CA who can well correlate to your situation 🙂 So,don’t worry, follow your passion and interests and climb the ladder of success. All the best ! Hello. I am giving my class 12th board exams and i wish to pursue CS course after 12 but i also wish to do a UG and PG course eith it. So which one is better with CS? Also guide me regrading to do distance or regular classes with CS course. Its good to see your interest in CS.Students normally prefer to pursue B.Com or B.Com(Honours) alongwith CS. The choice between regular and distance should be based on how well you can manage CS and other graduation degree simultaneously.Also,You need to undergo practical training of around 15 months during your CS course at a later stage,so make sure you can manage all the things well. All the best for the same. Thank you. I wish if you could guide me regarding the CS course details and the training that one has to undergo during CS. Is it necessary to have the training in between or can we do that after finishing CS? Thank you. I wish if you could guide me regarding the CS course details and the training that one has to undergo during CS. Thanks for the useful info. It is indeed helpful to students in deciding a good career option.How to build a career in law field. Hi Aakash, if you want to build a career in law field then you need to prepare and give the Law entrance exam. Your scores in the Common Law Admission Test(CLAT)or AILET or other state level or university specific entrances shall be one of the deciding factors as to which college/university you get admission.National Law universities consider your CLAT score for giving admission to their undergraduate programs. Hello,I am not good in maths. I am confused what subjects to take in order to become a software designer. My name is Adhil. I passed 12th. I am an average student in commerce, can you tell me which course is best for my bright career and I wish to study CA or CMA with my degree studies.Can you guide which profession is better. Hi, Can you tell more about CA and CMA. How many years study is it and about the papers are they tough or easy. Sir,I am Saksham and I have given 12th board exams.I am confused to choose a course.I am expecting to get 75% in 12th.So,please give me advice for my bright future. It primarily depends on your own interest as to which course to pursue after 12th.If you are looking for something basic, B.com or B.com (Honours) are two good options. Rest you can choose any of the professional courses as mentioned in our list but it shall need some extra efforts on your part.Your hard work and determination to complete a particular course is what matters the most.All the best ! Hello, I am Janvi Chopra. I have just done with my 12th and like most people even I am confused about which course to choose after 12th. I was thinking of going form BMM. Please suggest me is it a good course to do and have a good scope ahead. Hello,I had fixed my goal in 11th but because of average percentage in 12th I couldn’t achieve that. My aim was BAF but that does not seem possible.I have the option BIM which actually I am not so interested in doing. If luckily I get into BAF,their is nothing to worry.But, in case I have to do BIM,what are the career options after BIM.Please suggest me if their is any scope for it or not. I want to know that if I take the fashion designing course of 3 years then what are the different lines to be settled. Hi,we can give info on finance/commerce field courses.For fashion designing you need to checkout at fashion related courses websites. Hello,I am Subham,I am confused to choose between CA and CMA. I also want to know that can we start our own business or can we become self employed after CMA. Please clarify. Hi,I am Daman. I appeared for my 12th with commerce stream. I am sure that I will get above 80 percent.I had applied for CPT and I am taking coaching regarding this from the best institute of my dist. But I am confused because my family’s financial condition is not well.So,I want to do any practise which will help me in my studies regarding finance as per my wish. I want to do any part time job . Is it right for me or not? and if it is right then which practise is best for me. Plz send to me my answer as soon as possible . I WILL BE VERY THANKFUL TO U.
Hi,at this time you should primarily focus and build a good career for yourself.Its too young to start working and earning. If you put the best of your efforts,complete your studies and setup a good career,you can provide financial support to your family later on. However,if you still wish to engage in some part time work,you can go for simple accounting/book keeping.You know the basics of accounting, practice can help you become efficient in making accounts.You can take up small tasks from small companies/startups etc.But,remember CA is quite tough so you should not deviate from your main career goals. Hi,This is Karna. I have completed my Puc and my future plan is to write an UPSC and to final settle on IAS. Which is the best course after 2nd PUC commerce. Plz suggest me. I have appeared for twelfth commerce without maths this year. I have interest in business studies, so I want to pursue my career in the same. That’s why I am filling forms for BBA. Will it have a good future for me? What are the other options I should go for? Its good that you have decided your area of interest.Doing only BBA won’t give you the desired results.So,if you plan to build a fruitful career, doing an MBA from a reputed institute after completing your graduation can fetch you better rewards.All the best ! I am a 12th student currently.Please can u tell me what are the best courses if I want to opt for entrepreneurship in future. Hey my name is Shlok. I have given my SYJC boards exam and I haven’t taken maths.I am also very confused for selecting a proper field for myself.I want to do something related to business and management.I first thought of doing BMS and MBA but realized its very common and not having much value.Can you please suggest me some courses related to above information which does not include majority of maths. My name is Diwaker Jain. I want to do CA but as we all know it is not so easy.My financial condition is also very bad so I want to earn fast. I am scared that if I successfully complete CPT & IPCC but if I get stuck in CA Finals.So which other course should I choose along with CA to help me build a good career. Thanks for sharing this list of courses. Really helpful for students looking to set a good career after 12th standard.It is indeed informative. Hi, I am Ashik. I completed +2, I am trying to join CMA. Please explain the future demand of CMA. I passed out my 12th in 2016.Due to some problem in my home, I couldn’t get good percentage only 69℅.I belong to very poor family so I can’t study now.Can u please tell me how I can study at home with free course.Thanks ! I am Shivam and I have given my Hsc exam. I had adopted for IT-MATHS subject group in HSC. Now I am confused what to do further. I am not interested in BSCIT and BCA. I have a little interest in BFM. I don’t know about its scope or in other way I don’t know if its study is any worth or not.Can you please guide me. I am confused which course is best for me.I am a commerce student and I got 65% marks in 12th.I am weak in Maths and English.So, please can you give me advice to have a good career.Thanks. I am Bharat and I have appeared for my 12th a month ago.Actually result is yet to come. But i’m a bit confused for what to go for now ? So can you suggest something.I read your article but my confusion isn’t solved yet.I have an interest in finance and accounting , broker something.I have a sharp mind and I have been appreciated by many but the major drawback is that I don’t give that much of sitting during exams or normal. I AM IN 12TH COMMERCE . MY ACCOUNTING AND STATISTICS ARE BETTER THAN OTHER SUBJECTS. MY ENGLISH IS ALSO POWERFUL . BUT I WANT TO GO IN FUTURE WITH STATISTICS . BUT I DONT NO THAT WHAT CAN I CHOOSE AFTER 12TH PASSED. GIVE ME SOME SUGGETION. Hi,This is quite a detailed article to guide students to pursue the right career.Thanks. I have just given 12th board exam commerce . I have to give Civil Service Examination. I am confused about the courses in commerce along with B.Com. As if Civil service examination plan doesn’t work I want to keep plan B with other vocational courses. So,what are the options to pursue. I am doing B.com(hons) and CA. I cleared CPT. I have given 1 attempt of IPCC Exam. And now I m giving second attempt. CA is a very tough course, so I’ll clear or not in this stream so I want to know about.. Some courses that will help me to make my career secure if I am unable to complete my CA. First I want to know about the course actually plz.. Give me detail about it .Plz suggest any other course that is not too much tough as CA. And I can do that course with my graduation and CA. CA is actually tough and needs a lot of consistent efforts.Don’t lose hope, you have just given 1 attempt. There is nothing to worry about. You are already doing B.com alongside, that’s good. I think you should concentrate on CA and B.com right now. If you indulge in too many things together you may land yourself in confusions. For now,give some more try to clear CA exams. Meanwhile, you will complete your B.Com. If required you can go for an M.Com or MBA later on. I’ve just completed my Hsc exams.I am not sure which course should I take now.I have interest in Economics and I think I can go into Business fields also. Please suggest me courses for my Bachelors.I have no idea..
B.Sc(Economics),B.Sc(Hons)(Economics), BA(Economics),BA(Hons)(Economics), Bachelor in Economics. Further there are various options at graduation level like Applied economics and Business Economics fields etc. that can be selected as per your area of interest. If interested in Business courses, doing an MBA from a reputed university can prove fruitful at a later stage. Rest is based on your interest and choice. I have completed 12th commerce in India. I am willing to study abroad. Money is not a problem. Suggest be all the subjects to major in related to commerce. What tests are required to be completed to be admitted prestigious universities. If you wish to study abroad you have different choices to go ahead. 1.You need to decide in which country you wish to carry on your undergraduate degree/course. 2.You need to clear the Basic English Language test as applicable in the respective country like IELTS. 3.Your academic score in 12th also matters while seeking admission to any of the colleges/universities abroad. 4.There are various degree and diploma courses provided in the fields of Accounting,Economics,marketing,business,management,Finance.Maths etc.The choice of course should be based on your own interests. Make sure you go abroad through genuine channels only and study in a good institute to make a great career.All the best. Hi,I am Rohini and I have just completed my board exams this year without maths . I want to know which courses are available without maths . Hello, myself Harsh Pal. I failed in 11th class due to my medical health so I am confused as I should do by regular or open to continue 12th class. But, my numbers in other subjects are 50+ and I want to be a C.A.So, what to do. Hello I am Riddhi…I am appearing for HSC exams this year.I am a commerce student.I wanted to ask that can a commerce student do any kind of beautification courses. Hi Riddhi, There are several diploma and degree courses that you can pursue after your 12th.Some institutes even provide short term courses and traning in beautician courses. Hi, I’m Yohith and I’m studying in 12th commerce. I want to do BA and then to do graphics and designing. I’m confused that what to take in BA so as to do graphics and designing.And is it possible to take graphics and designing after completing BA.Please reply me as soon as possible.Thank you. Hello, I am Yogesh. I appeared for 12th board exam a month ago.I am willing to get marks near to 90% and I am confused in doing CA or to appear for bank competitions.I am also confused in graduation degree either B.com or BBA. I am a commerce student. I just gave my 10th and I am really confused should I opt maths for 11-12 since its pure maths and college has commercial maths. Please advice me on this and give me some career advice with and without maths of 11-12 . Does MBA,eco honours or A/c honours and CS needs pure maths. What can I do in 11-12 as a side course that will be beneficial for my career. I am commerce student.Please guide. Is it possible to do BCA after 12th commerce. Hi, You can pursue BCA. But,you need to check the eligibility requirements of different universities.The common eligibility criteria is 10+2 with 50% marks.While having Mathematics or English (in your 12th) is also an additional requirement at some places. Thanks for sharing this list of useful courses.I am thinking of doing B.com from a good college. I have appeared for 12th commerce.Now,I am totally confused about my career.I want to do a job because of financial problem.So,please guide or suggest any courses that can help me in doing a job after or 6 months or 1-2 years. Hi Mohit, You can try learning some accounting/bookkeeping that will help you get a part time job somewhere. Hello, I’m 12th passed but I don’t know what to do after 12th.I was thinking for CA.But, I want to know more about this course.If I fail in CA examination there is no choice for another course. I’ve given my 12th Board Exams, I had dropped Mathematics and I find Accountancy a bit tough! I would like to know other courses other than these mentioned^^ (or, which website shall I visit?)? I have heard about Actuaries << What is it all about? Hello, My son appeared for 12th CBSE exam waiting for results, commerce student along with bcom he can do ca course,is it so tough ? or he has to attend regular class for CA too. Hello Sir,a professional course like CA involves consistent efforts and a strong determination. It requires immense hard work and regular studies for a student to clear it. The final decision should be based on interests of the student. While pursuing CA,it is better to complete B.com through correspondence so that greater emphasis is on CA. There are no regular classes for CA. Also,one needs to complete compulsory articleship(training) during the course. Further,the students prefer going for coaching classes for few subjects.So,the things need to be planned systematically in order to avoid any extra burden on the child. Hi Bhavika, You have raised so many queries at a stretch.You seem to be really confused.Right 🙂 Firstly relax and think for yourself : What you really wish to do ? If you are going in for mass media/communication, why you are planning to have an alternate course.Your focus should be on one primary field.Is there any specific reason for it. Regarding best colleges,there are various factors that affect the choice of college like your academic scores, your location,feasibility, your priorities etc. Hello, I am Gourav I am confused which course is best for me. I am interested in doing IAS so tell me more about it. Can I go for such field please suggest me.Thank u ! I am KHUSHI, I am currently doing my 12th but I am scared about my future plans because am very confused as to which course should I take after 12th.A lot of my friends are planning to do ACCA after hearing about it from one of our senior.Please help by recommending which course can I take.Waiting for your reply…Thank You ! Hi Khushi,you should follow your own interests. The things that matter are : What you like and what you wish to do? Which are subjects of your interest ? What kind of course you are willing to do ? Once you get the answer to all these queries,making a choice shall become much easier. Getting influenced by your senior is ok but the final decision needs to be yours in consultation with your family. I am Dharani Vasan. I have passed in all subjects in commerce but I am weak in Accounts.So, please refer a good course in business etc. I am Rajnanadani Roy. Can u please suggest me a career oriented course for girls. I appeared in 12th CBSE EXAM SCIENCE STREAM but I want to change the stream.Please suggest me a good course to choose and the best option which helps me to build my career and give success. Hi,The choice of the course should be based on your personal interests.Which subjects you like and in which field you wish to build your career.What matters is your own interest and comfort level in doing a particular course.You appeared in 12th Science stream but now you want to change your stream.The first thing you need to do is to make up your mind as to which stream you wish to go for now. Girls are equally competent and can easily pursue a variety of courses in any field. Once you decide a particular stream the selection of course shall become easier. Hello sir,I’m commerce/IT student.I’m appeared for 12th board exam a month ago.but I’m still confused that which course should I take after 12th.actually I’m good in accounts but little beat good in maths.can I go for BBI,BAF etc..fields.waiting for your reply. Hello, my name is Uzma. I have given FYJC exams this year and will give 12th boards next year.My father is having his own travel and tourism company and he has been training me too since 3 months.I want to join and help my father.But,I also want to do something else simultaneously.Can u suggest me any good professional course.I hope you can understand my problem.Please suggest me I am confused.I just want do something which suits me.One more info,I love marketing concepts.Please advise. Sir/madam, I am writing this comment for my little brother. He finished his HSE final exams (commerce with mathematics) I hope he scores good marks. He is not bothered about his future. That’s why I am here to clear some doubts.I am a B.com graduate and os BSW( BACHELOR IN SOCIAL WORK).. I heard it about a few time.. I hope you will reply as soon as possible. Hi,Can u please clarify a bit on what exactly you want to know about. I have just given the exams of my 12th(commerce) … I am very confused what to choose now for my future … I cannot setup my mind in 1 direction … I feel BBA would be easy for me but on other hand I dont think after taking degree from BBA .. their could be a good future for me?? To be very frank sir … I am not that “kitaabi keeda” type student … i want to enjoy my Life happily but I have tension of my future too. pls help me to take decision as soon as possible. If you are not too much addicted to your studies , and want to enjoy your life happily . I would rather suggest to opt for hotel management or flight attendants. It has a very good career option with a high salary scale. I am Pooja Sharma.I want to do something in banking line with maths.Is B.com honours beneficial for career in bank. Hi Pooja, B.com and B.com(Honours) shall be helpful if you want to build a career in banking.You will become familiar with the basics of accounting,law etc. You can prepare and appear for Banking exams as and when you feel comfortable.Keep checking for various Bank exams and eligibility criteria. Moreover,having an undergraduate degree will surely help in getting good banking jobs. Hi, I am Meghav. I am done with my 12th commerce board exams.Now, I am confused about what field should I choose.I have my interest in Accountancy.So,please suggest me the course I should pursue. Please tell me that can I do such courses alongwith B.Com. I have just completed my high school & I m waiting for my result.I am very much interested in commerce but few of my relatives are saying that commerce requires a lot of hard work and nowadays there are very less chances to get a good job.So I am little confused that am I taking a correct stream for my future or not ? Hi Shreya,If you want to achieve success in life,you need to put some hard work and efforts for it. You should follow your interests and getting scared of putting in hard work is not the solution.Nothing is easy to achieve especially when it comes to pursuing professional courses.Be clear about your goals and decide what is best for you. I have passed 12th commerce with 92% marks. I am confused which field I should take CA or do B.Com honours or any other field. I want to do CS…but my result is pending of 12th CBSE so what necessary preparation regarding course,study and registration.Also study material I must do plz suggest. Hi Mahak, You can get all the requisite details at http://www.icsi.edu/ All the best ! After doing Bcom can I again take BAF or BMS?I am totally confused what to take can you please give more information about BAF,BMS. Hi Omkar, Why are you interested in doing dual graduation degrees.If you do B.com then is there any specific reason you want to pursue another Bachelors degree. Instead,you should look for a Masters degree after completing a graduation degree. BAF basically deals with Accounting & Finance. Few subjects are similar to what you will study in B.com. While BMS is Bachelor of Management Studies where you can get specialisation in various fields like management,marketing etc. Anyways,you will get an added advantage if you pursue a Masters degree like MBA after graduation. Hello, I am Rittik. Now, I am studying in class 12,not yet given the final examination of HS.I want to ask u a few questions about my career,what should I do.I am not as very good in Maths.So which course should I do after HS final. Should I go fore BBA,BCOM or any other. Actually I am interested in doing business.I want to do high class business.For that only I am confused too much.CA and CS are tough and will require much time.I request you please help me to decide my career. Hello, I am Gajalakshmi. I scored 491 marks in 10th and I am studying.I hope that I will get good marks and I am a commerce student. So please tel me CA is more valuable by doing after degree completion or straight away by appearing CPT exam. According to you for working with RBI and as a banker, which degree should I pursue? Hi, I am Chaitanya Kini. I just finished my 10std.I want to take commerce and I am little bit confused….so plz help me. I want to ask u that doing BBA is beneficial or not. Plz guide me. Doing only BBA won’t give you the desired results.So,if you plan to build a fruitful career, doing an MBA or another masters degree from a reputed institute after completing your graduation can fetch you better rewards.All the best ! Admin,I have completed my plus two with 88% marks.I want to know about CS.Also,can I handle CS and BCOM at the same time.Please help me. Hi, You can get all the requisite details at http://www.icsi.edu/ Students generally pursue CS alongwith another course like B.Com. There are no regular classes for CS, you can easily manage graduation degree with it. There is a compulsory training to be done during CS course, just make sure you manage it well simultaneously. All the best ! Hello, I am Jay. I am a bit confused whether to choose commerce or science after my 10th. Actually first I wanted to pursue CA with LAW. But then after demonetisation and digitalization,I feel that the need of CA will decrease as the computers will automatically do the work. When I asked some people about the scope of CA in future (next 8-10 years), I got answer as, now because of computers and programs, we don’t need a CA and we do all our work of records and files on our own in computers. So, I am confused what to do. Can you please help me out here? Also,I wanted to know other such combinations like CA and CS. Hoping for a positive reply at the earliest. Hi,I have given the 12th board exam in commerce. I’m really confused which subject I should prefer. I want to read IT but I’m not good in Computer Science. My favourite subjects are Accountancy and Maths. I’m not good in theoretical subjects like Economics and Computer. I really want to study which is more related to practical questions like of Accountancy and Maths. Please suggest me some. And I don’t want to study BBA,CA and Hotel Management. How would be Tourism for me? Is it theory related subject? Please reply my comment I really need your help. The courses mentioned above in the site are regular and routine ones.People should move away from the regular, generic courses and highlight the new career options opened up in the recent past. Many universities have done enough research and started offering new courses and one such course is Bachelor’s in Catering Technology and Culinary Arts. Today food industry is the most happening industry in India and the opportunities are plenty in this field and young people who are passionate of travelling, creativity, food and beverages can opt for such courses and can make their career in this industry. Hi Sowmya, Thanks for your great feedback.We appreciate the same.Our motive is to share the courses specifically in the finance and related fields as per our blog niche. But, we would surely like to discuss on such new career options in one of our articles to add to the knowledge of our readers. If you have any experiences and content to share on any such course, feel free to do so. If we like it, we shall post the same on our website.You can email us the details and any relevant content you wish to share. I got 68 percent in 12th commerce.I am confused,please help to choose a good course do build a great career. Hello,I have given my 12th board exam and within few days my result shall be out. I am an average student thinking to get between 70% to 80%. And I am little bit worried also.I am thinking to do BBA and CS together.So, Can I do it together or not? As I am interested in theory subjects. So, can u please help me in giving the best suggestions. And which college or university is best? And are there good placement options after this course. Hello,I have given 12th boards in commerce.I am confident to pass out with good marks, but there’s some confusion as I have still not decided my graduation course.I am planning to do full time MBA from a reputed college.But,I don’t know which graduation course will help me for MBA and which will be the good one.I don’t know,but just heard that B.Com degree has less value as compared to others.While the second thing in my mind is,BMS. Plz help in this situation and guide me for choosing the perfect graduation course. One of my teachers said get as much as practical knowledge in FY and SY. But,do we get enough of time in BMS after handling college,projects,classes etc? Hello,I am Simran. A commerce student…actually I want to know that what kind of preparations are required to clear CA.On which subjects I should pay more attention. Hello! I got 81% in my boards (commerce) and I wanted to go for B.com(hons) but since all good colleges have high cut offs, I am not able to help myself. So,can you please help me with some good suggestions. Hello, I recently completed my board examination and got 70% marks in commerce without maths stream.I am an average student,I am still confused between CIMA and ACCA,can I pursue such courses after 12th and I want to go abroad.Please suggest me about these courses. Now,I am taking BAF but in future if I want to take BBI, is it possible to change the course after one month ? Please guide. Hi,I have just given my SSC exams and I am confused which course to do after taking commerce. Can you help me? Waiting for the reply. Hi,I secured 94% in 2nd PUC commerce stream.I have already joined for a normal B.Com.My question is that can I do CA after my degree also? And if I can, what will be my steps or levels to face? Tell me something about it. I want to ask you to give me a proper advise about LLB.After 3 years of B.COM or BBA or BSC. In how much time we can pursue LLB and LLM ? Please reply. Hello,this is Bimal.I complete​d my 12th with 53% and I didn’t take Maths.What can be the best course for me,as I don’t like Maths.What will be suitable for me ? What about CS or Event management ? Please guide me with these. Hello, I scored 70% in my 12th exam and I am a commerce student. I don’t really know what courses to do further.So, Please help. Hi, firstly be clear as to what are your interests,which are your favourite subjects and what you actually want to pursue ahead.Once you think about these,you can make the right career choice.Thanks and All the best ! I recently passed my 12th class with 84% marks in commerce. I am confused which course to select. Please guide. Hi Pankaj, Congrats! Firstly be clear as to what are your interests,which are your favourite subjects and what you actually want to pursue ahead.Once you think about these,you can make the right career choice.Thanks and All the best ! Hi, I am confused between CS,CA and CMA as which one is good to pursue with B.com. I have scored 88.2% in my 12th board exams recently.Earlier I thought of doing CA but after hearing the difficulty level,now I am thinking of doing CMA/ICWA. Plz guide me about CMA. Is doing CMA a good choice ? Plz help me to build a good career ahead. Sir, I have done my 12th in commerce.I didn’t score well.But,I really want to do hard work further.So I was thinking of doing hotel management.Please suggest a good course for me in hotel management.Please I am really confused. You are doing a good work helping students to have better insights on different courses.Thanks for sharing this useful list. My brother has passed HSLC exam from SEBA board with 69 percentage and he wants to go for commerce stream.But,we don’t know what is the scope of commerce,so please help me. I am very much interested in cooking and my passion is also to build a good career in cooking.So,I searched for BSC in food and technology.But, commerce students are not eligible for it.So,is there any single chance possible for commerce students in this field. Please reply as soon as possible. Hello,I just passed 12th and I’m very confused on what to do as everybody tells me a new course everyday and kind of assures me that I’ll have a prosperous future.But all I get is confused from such suggestions.Please guide me what’ll is best for a commerce student. Hello,my name is Bhavik Katiya.I got 64% in HSC board general stream. But,I am confused. Suggest me a good course to build a successful career. Also,suggest me a university in Gujarat. Hello, I am Sufiyan. I recently passed 12th std commerce.But,unfortunately I got 50% only.Now,I am confused what should I do ? Which course to choose ? I am interested in airlines ? What do you suggest is good to do.Please guide. I have chosen 3 group Commerce with Computer science.Am I having the scope to attend B.Com ? Which courses I can do to get a good job ? Please help. I recently passed H.S.C with 85%. I want to get a job in bank that’s why I am thinking to study B.Com . But I am so confused.Please guide me. I have scored 61.00% in my 12th board exams. Advice me to take right decision about my career. I am giving my board exams this year.I am really confused.I really want to pursue my career as CA and I want to know the details about it and the difficulty I will be facing.Please guide with some other good options as my aim is to get hired abroad. I am 12th standard student.I have not opted maths in 12th because I found it difficult in school days.So can I pass CPT exam or do BAF after 12th.Can u give some details about BAF course. Thanks for sharing this list of courses.I was really confused what to do.This is quite helpful to me. Hi,I recently passed HSC boards with just 56%.I am damn confused what to do after this.I don’t have interest in studies but I want to educate myself. I have internet in dance.Can you please help me with this situation. Hi,I am commerce student and got 66.57% percent in 12th exams.I am confused as to which course is best for me. Please reply. Hello,I am a student of commerce.I have passed 12th this year with 85% and I want to pursue B.Com alongwith my trading business.So, please advice me if my decision is correct or not.If not then suggest a best course for me. Hi Dheeraj,it all depends on your interests.Its good you want to help in the family trading business.You can pursue B.Com or any other Bachelors degree as per your choice.But,make sure you are able to manage your studies alongside your business. Hello !I gave my board exams in March 2017.I aspire to become a CA.But I also want to opt for MBA.So is it fine that I’ll pursue for my MBA after completing my CA? I mean is it a good choice? Hi Shravani,CA followed by an MBA is just like icing on the cake if you wish to enter the corporate world and gain a good position in a reputed Company. But,CA itself requires immense hard work and consistent efforts, so if you wish to be a part of this esteemed profession take a firm decision and focus on it. Hello,I gave my board exams in March 2017.I aspire of becoming a CA.But, I also want to opt for MBA.So shall I do my MBA after completing my CA? I mean is it a good choice? Please help me. Hi,I am appearing for the class 10th exams.Please give me advice for my future if I want to do a banking job. What should I do.Which courses should I choose for future and which one is better for me. Please answer me Sir/Mam thanks. I am a currently a 12th student and my stream is commerce with maths.I am really very much interested in Maths.Could you please help me to know about some courses where I can pursue Maths for higher studies and the related jobs and salary about it. Hi,I had completed 12th with 84% in 2016 and I have joined B.Com but now I’m confused between fashion designing and MBA. What to do after graduation. Please tell me other options. Hi Shreya, Congrats for the result. Fashion designing and MBA now these are two extreme fields 🙂 The primary thing you need to do is decide what are your interests, you want to see yourself as a renowned fashion designer or a renowned management expert working in the corporate world few years from now. You will get your answer as to what to select.B.Com and MBA is a good option if you wish to get a corporate job but not if you wish to pursue fashion designing. To build a career in fashion designing you shall need to get the desired qualification in the fashion designing industry. All the best ! Hello sir, myself Nikhil Chaudhary here. Sir I just gave my fy.bcom exams and got failed in it (due to some personal family problem).So, what should I do now.Please help me in making a bright future.I received 53% in 12th.Should I continue my B.com or choose some other field(if other field then which one).Kindly suggest me a way. Hi Nikhil, There is nothing to worry about,success and failure are a part of life as far as you learn from them.The first thing you need to focus on is the field of your interest. If you failed just due to some family problem,then you can anyways overcome the situation once the problem is solved.You should continue with your B.Com with extra efforts this time. But,if your interests are different and you want to go ahead with some other course,think again and take a firm decision.You may get many choices,decide what you like and which way you want to move based on your favourite subjects and area of interest.All the Best ! Hello,I am Arpit and I am interested in the course of mass communication.Is that good for me ? Hi Arpit,the course choice should be based on your interests.Mass communication has gained popularity over the past few years.Its not restricted to journalism alone,you can get to explore diversified areas in the field of advertising,public relations,TV,newspaper,other media,editing,publishing etc. So,based on your personal interest you should proceed.Good communication skills,creativity,confidence and patience are the key factors to consider while doing this course. A good article to read. Thanks a lot. Hello,myself Pravesh and I am a student of B.com 2nd year.I am so confused about the courses.So,can you tell me that what should I do for my successful career. Hoping for the suggestion from you. The reason of writing this because I’m tired of worrying about my little brother. He has just passed his 12th in commerce with very worst percentage( Aggregate 49.8%). He never gave his best try to his studies and now wondering which way he should head for better future. Well, I am unable to guide him as I belong to different field and working to feed my family. I’m a diploma holder after 10th and working in an MNC firm. I’m pissed when he said he wanted to pursue some sort of job in his field but he is under 18. Now please you suggest me what action I should make upon him ? I want him to pursue his further studies but he has been denying. Although he could go for some other profession course like any diploma in finance etc. I’m not well versed with any courses related to commerce field. You may have a great experience regarding it. You are suggestion is the only hope for me. Hi Sajid,Its really good to see your concern for your younger brother.Firstly,make him understand the value of studying now in order to build a good career.Doing a job right now without completing study won’t be helpful.But,studying now will surely help later on to get a decent job and salary. Further,finance field is not so easy and looking at your details it doesn’t seem that he might agree for it.If he is not interested in commerce let him take some easy option.Its better to complete at least a basic graduation degree(B.A. or any simple diploma or anything he feels comfortable and easy to complete) that will help him at a later stage.If he is still not convinced to opt for regular study and wants to do a job,there is also another option for distance learning courses.He can easily do a small part time job and complete his studies also. Hello,I am Rajat. I am doing 12th now.I am confused what to do after 12th.I have Commerce with Maths and Informatics.What can I do with it ? How is BMS(Bachelor of Management Studies) course and in this this course how much scope is there for a good career.Is BMS beneficial for me ? Hello,I am Ankit.I only scored 55% and I am confused which course I should choose.I passed 12th from commerce.Please help me and guide me towards the right path. Hey. I am Mohit Jain. I am actually studying in 12th commerce. Well, I know that its only the beginning of 12th but actually I want to decide my course now because there are few colleges where entrance tests are in December.So, I actually want to get ready before hand.But, I am not able to decide which course I should opt for after 12th. I am really confused. So, please help me and yes actually I am not good at Maths but my Accounts and Economics a revery good and I even have interest in them. So, please guide me a good course. I am Nishtha and I am an average student.I cleared my 12th commerce with 72% marks.I am pursuing B.com (private) and have further plans to do MBA.But,I want to do something along with B.com so that if I don’t get into IIM at least I can have some other good options.Please help me out. Sir I have done Olevels through engineering and I have scored normal.Now I am thinking to go for ACCA by doing FIA. While doing ACCA I will go for Intermediate which means I could then do BBA OR B.COM.However,I am a little worried that is this Option(STUDYING ACCA) correct for me or not.As I have an Engineering background though I have an interest in Commerce field.So,can you suggest me whether I am making a wrong or a correct decision. It is so nice of you that you counsel each and every student who is in need of help. May God bless you. Hi Ahmed,sometimes its not possible to give instant replies to all the queries.Anyways, you are saying that you are interested in commerce but doing engineering.So,first of all you need to clear this confusion.Make up your mind and explore your actual interests and then proceed in the right direction.You are from an engineering background so you shall have to put in some extra efforts and hard work for building a career in finance and accounting.Commerce and engineering are two totally different fields.But,you don’t need to overburden yourself with too many courses.Relax and take a wise decision. Hello,I am 27years old, a CA inter qualified. I have given 6 attempts of CA. Finals but haven’t cleared. Now I am confused whether to leave or to pursue CA or should I go for any other professional course. Hi Richa,I know its really hard to try again after so many attempts.Don’t be disheartened,success and failure are a part of life.Its your decision as to how you wish to take it forward. Relax and discuss it with your family as to how to go ahead.I have seen so many people not giving up even after multiple attempts and coming out with good results.However,its your choice and courage to continue that matters.Just make sure that you do get a basic graduation degree alongside.Doing a post graduation course afterwards may also help.All the best ! At the end of your blog you have mentioned about some information for abroad study.So,here I would like you to write and add another additional blog on various courses,scope,eligibility,average salary,and last but not least your valuable ideas,suggestions,perceptions and views available after 12th commerce.I would also like to inform you that i am a student of class 12th commerce deciding to study abroad after 12th and I am bit confused in that regard.So,it would be my pleasure if you can help me out in desirable way. Hi Jigar,We shall surely add an exclusive post very soon on different courses after 12th for studying abroad.Thanks for your feedback.We shall try to help in the best possible manner. Hello,my brother is studying in 12th Commerce. He scored in every standard around 40% to 50%.He is not able to choose a course.Can he choose Certified Financial Planner(CFP).Please guide us. I’m a commerce student and I’m totally confused about what to do after giving my boards.I want to know about all those courses that one can pursue after 12th.In which courses I can build a good career and get a high pay. I’m interested in CS course as well as in CMA,which one should I pursue? Please guide. I am a commerce student.But,I am least interested in the courses.I want to do my own bike building work.What can I do after my 12th. I passed my +2 with 85%(commerce with maths).Currently I am pursuing my graduation(B.Com finance).I wish to do CS after completing my graduation.Could you please tell me what will be the time span to complete the course.I am little bit confused whether I should do CS along with my graduation or not.I am pretty good in theories.Whether I would be able to pass in 1st attempt itself. Hi Sherin, Doing CS alongwith your graduation might save you some time since you shall be completing 2 courses simultaneously.But,all this depends on how well you can manage your time and study.Also,if you are good at theory then doing CS won’t seem difficult to you.It has some theory subjects which you can cover up easily if that is your area of interest.Regarding passing in 1st attempt, it is all based on how well you prepare and how much efforts you put in studies.However, if you study consistently you can achieve your dreams smoothly.All the best ! Hi,I am not good at Maths.I want to take LLB and try CS.So, please help me in selecting one good course for my future. I am currently pursuing my 12th commerce with computers.I am interested in computers and business studies.I also want to establish my own firm in future.I am too much dedicated to run a business.But, I am an average grader.I don’t know where I will land after results.So,can u please help me find a good course or set of courses that can help to keep me in touch with both of my interest fields. I don’t want to opt for BCA. Can you please tell me something more valuable. I passed 12th standard 10 years ago.Now,I am working in an administrative job since last 8 years.But,I can’t go so far with this. So,I want to do something more for my future.Please suggest me what courses I can do for better future. This blog is very useful and provides nice information about all courses after 12th.It is helpful for choosing the right career. Thanks for posting, keep sharing such useful information. It is a helpful article for choosing the right career path. It really has great information, thanks for posting such a nice information. I am a +2 student and I am pursuing commerce with maths. I am very confused what course should I take after my high school ends.I don’t favour theoretical subjects.What course should I take? Please suggest. I pursued commerce(with Maths) with high ambitions of succeeding in it. My First Term Results of Class 11 have just been received. I thought my exams were very good and expected 90% plus. But as it turned out, I remained stuck at only 84%. Its been a hard pill to swallow as I’ve never hit such a low in my life. Do u think with this sort of a result in class 11, I’m capable enough for clearing CA, or should I opt some other course. I was really looking for someone like you.I am currently doing BBA in Dubai.I plan on going for IAS or IPS exam in future.But I am not sure if I can make it so as a back up plan, I need one more degree to do along with my BBA.I am pretty weak in Maths but really good at all other things.Could you please suggest me some courses which I can do as correspondence.I don’t wish to do LLB because I plan on working here in Dubai or any outside countries.So there won’t be any point studying law in India.CS is a really good option but I am currently doing my 2nd year in BBA.CS consists of 3 stages.Without a proper degree I’ll have to do all three stages.I am little late now because 1st stage exam will be held in June or July but at the same time I’ll have my BBA exam for semester 3. Registering now and registering after completing my BBA degree will be just the same. So could you please suggest some good degree I can do right now along with BBA which has got good value. Hi, At this point you should concentrate primarily on your board exams.After that,relax and think what are your actual interests.As per your details,you feel that your interests are marketing,entrepreneurship and finance field.But,these are 3 diverse fields.So,you firstly need to decide a particular field which you want to choose.Marketing and financial work involve different set of skills and qualifications.I don’t think there may be any issue in changing your stream from science to commerce if you really want to.In order to make things easy and take the correct decision,you should discuss this with your family and teachers who can guide you in the right direction as they know your talents better. Yes, but you may need to put some extra efforts to clear your commerce basics for a smooth transition. I’m in class 12. I’m a commerce student with Maths. In future I want to do MBA in marketing or finance. Please suggest me the best course to do before going forth with MBA. Hello, I am a commerce student with Maths.I am an average student getting 60-70% only.I am interested in professional accounting(B.com) after 12th standard.Is this a right choice or is there any other better choice to make. Thank you for sharing this article.You have provided so many good courses that we can pursue after graduation. Hi,I am in 12th now. I will be giving my exam in Feb and I want to do job after 12th class.Please tell me which course should I do after 12th so that I can handle my job and studies together.I am interested in doing business also.Please guide. Hello,I am a student of class 12 currently in Lucknow. I am a student of commerce with computer sciences.Can you please suggest me some good fields in which I can give a try after 12th class.It would be really thankful of you. Can a student who has not got best percentage in 12th do these courses.I got nearly 60%.Can I do these courses. Plz tell,I am so confused. Hi,Don’t worry you can go for these courses.Just check with the college/university where you want to do your graduation from.They may have certain criteria for admissions.All the best ! Hello, I am a student of 12th commerce.I want to go in banking field specifically investment banking.Can you please advise me what are the initial steps to become an investment banker? Which is the best course for investment banking? Hi , I completed my 12th in 2015 with 98.75% marks and then went ahead to pursue CA . I got through the entrance test on the very first attempt . But when I got into the course, I realised that, this is not what I want to study and hence I lost my interest in studies. I couldn’t concentrate on studies or anything. It has been 2 years and I have not passed the exam. I am afraid to drop this right now, in this stage, since I have invested a lot of time and money in it.I don’t know what to do. Hi Divya, I can well understand your situation.This is a common thing faced by students once they enter a professional course like CA.There is a lot of difference between what you studied and the way you studied earlier.In a professional course you need to be more specific towards your goals. Going through your details, you are a very intelligent person who scored 98% in 12th exams.That’s really wonderful ! You joined CA course that means you were interested in doing it.But, now you feel that your interest in it is fading. Success and failure are a part of life as far as you learn from them.Don’t worry, you can anyways plan a good career. Firstly,relax a bit and then talk to your family,discuss with them and move ahead to achieve your dreams.CA involves consistent efforts and a strong determination.It is not an easy course. But,there is no need to burden yourself. Think deeply and analyse, whether you want to give it another try? It’s your choice and courage to continue that matters.Your career decision should be based on your own interests.If you want to pursue some other course,just make sure to complete a basic graduation degree alongside.Doing a good post graduation course afterwards shall be an added advantage.All the best ! The above marks will give approx 80-85%.My parents want me to do an MBA through IIM. I am also willing to do it and I too love BST and management part.Help me sir/mam that I am on the right path or not.Is this good or is there any other option available.If I am planning to do MBA from IIM,Ahmedabad. Hi Aman,Thanks for your appreciation 🙂 Looking at your marks,you seem to be a really studious and intelligent guy.Keep up the good work! If you have interest in management and business skills.Doing MBA that too from IIM,Ahmedabad that is one of the best business schools, is a great decision.It shall help you in building a bright and successful career ahead. You need to appear for CAT or GMAT(as applicable).But,remember getting seats in IIMs is not an easy task,the cut off is high.You need to put in extra efforts to get a place in the top Business schools in India.Anyways,if you have a strong base, you can work towards achieving your career goals in a planned and a determined manner.All the best! Thank you ! Now talking about IIM as the cutoff is very high.I will definitely try to clear it in first try.If I didn’t clear CAT-GMAT then what are the options left with me. Hi Aman,For now you need to concentrate on getting a bachelor’s degree.Post graduation degree like MBA can be pursued after that only.Having a clear goal in mind and working upon that simultaneously will surely help you to succeed.All the best! Please add some information regarding International Business degrees also. That will help students know about various courses to pursue abroad as well. I am pursuing HSC. I would like to request you to suggest me the course which shall help me earn the highest salary. Hey, I am in class 11th currently with commerce stream (Maths). I want to go in technical or computer related line. But,I didn’t choose medical or non-medical as I was not good in that. But when I got to know that BCA is a good course for Technical area related to PC and commerce students can take part in it as well. I am interested in it. But I want to ask if I indulge in this course will I face difficulties as I am not a science student. And if I won’t be able to clear the paper of BCA then which other courses I should refer that are relevant to my interests. Hi! I will be in 12th within two months.There is one more year but still I want to make my decision as soon as possible. I am sure I can do well in any branch but that is the problem,I am not able to choose one path and my mind is wavering all the time. Right now all that I have decided is no CS or CA. I am interested in management and investing. What will be the right courses for me.I have to make sure I don’t regret later. Hello, I have completed my 12th class from commerce stream. Now, I want to do a good marketing course.Is it possible now or I have to complete my graduation firstly. Selecting a career option is one of the major decisions in a student’s life.Thus, it must be made wisely after proper attention and understanding of the field. This is a good list of best Career options after 12th commerce. Some more courses like BBA, B.A(Hons)English, B.A(Hons)Economics, B.A(Hons)Psychology can also be considered. Hello,I am a student of class 11 and my stream is commerce with entrepreneurship. I am basically unable to understand and direct my interest in what should I do after 12th class. I am unable to decide which course option should I choose, to have the best.Kindly help me to get to know about my correct field in commerce after 12 . Hi Kritika, Its quite normal to get confused while deciding the right career option for yourself. Firstly, you need to relax and think, What are your real interests? Which are your favourite subjects? What you really enjoy doing and pursuing as a career option? Do you want to get into a regular career field or are you thinking to opt for a creative career alternative? Once you get the answers to these queries, it shall become easy for you to decide a good course. You are in 11th now so you still have ample of time to take the correct decision.You can discuss with your family and teachers about various career prospects. Choose the one that fits your interests. All the best! I was just searching for some good courses after 12th commerce and saw this article. I must say that you have really done a wonderful work explaining each and every course minutely. It’s a big help for students looking for different career options after 12th standard. Thanks a ton! Hi,Please confirm that, Bachelor Programme of Commerce is equal to Bachelor of Commerce? Hello,I am appearing for 12th board examination. My interested is in computer work. I have a basic computer knowledge and a good typing speed plus some additional skills. But I am from the commerce stream.I can spend lots of hours even a whole day on PC. Please suggest what should I do after completing my 12th standard to build a good career. Hi,I am an average student. I am very weak in accounts. I am in 12th standard. Please give me some idea. I want to become a manager. Which course is better for me? Please guide. Hi, I am doing B.com now.I am very much interested in business studies.But, not much interested in Accounts and Economics. My parents said B.com will be the best option for me.But, now the situation is that I have lost my concentration in studies. What can I do now? Which course would be the best for me? Please guide. Hi, what about animation as a career? Is it a good choice? Please guide. I am a 12th student and I don’t have maths in 12th class. What are the courses that I can pursue. Please suggest me best colleges also. Hi, I am doing CA and M.com. I am already giving 4th attempt of IPCC but not yet cleared. Now what should I do, quit CA or not. If yes, please suggest a good course. Please reply fast. Hi Zainab, You are already pursuing M.com along with CA. That sounds great! You can at least give another try for IPCC. Otherwise you already have a backup option as M.com. It is all based on your own interest and courage to appear again. CA is not an easy course. But, you are thorough with the syllabus. Put some extra efforts on the subjects you lagged behind and overcome your weakness. We have seen students giving multiple attempts and still coming out with flying colours. Patience matters a lot here. Just analyse, what you actually want to pursue? Its your interest that matters the most while taking a good decision. All the best! Hello,I’m in 12th std commerce.My board exam will begin in Feb. I want to know which course I should choose. I don’t know much details and what are actual benefits of different courses. So, please give me some details and suggest me the best option. Hello, I am in 12th std and I am interested in management. I want to know that does B.com course has any special subject like management (like B.com in management) or I should go for BMS? Please guide. 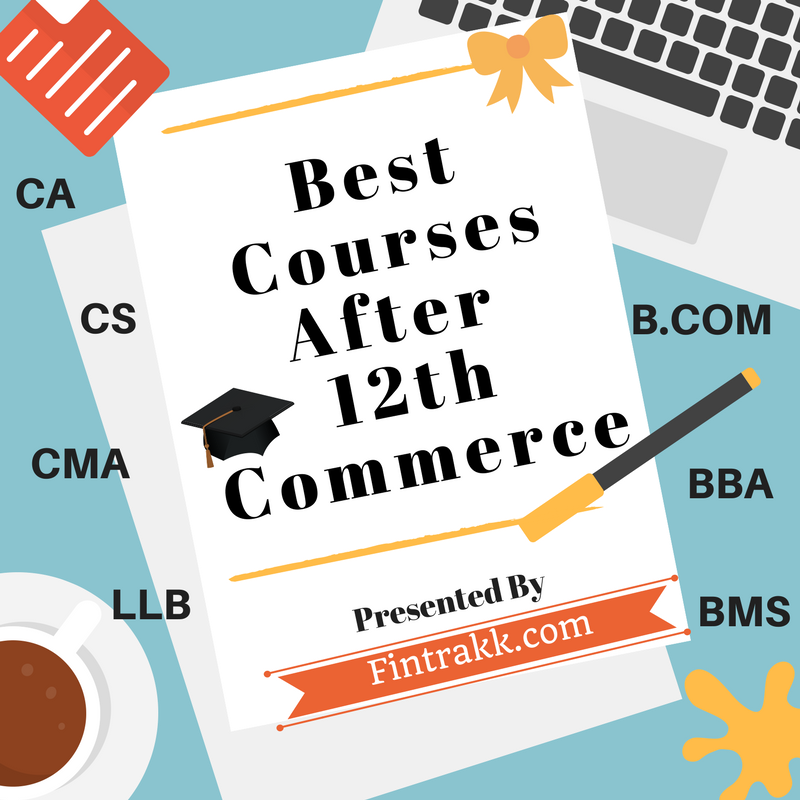 Thanks for sharing this brilliant list of best courses after 12th commerce.This site is very helpful for me and other commerce students. When some one searches for a required topic, he/she desires to gather various available and relevant details. This thing is surely maintained over here. I am glad that you simply shared this helpful information with us. Thank you. Hi, I am a student of 12th commerce. I want to become a CS .What is scope of this course? Please guide. I want to become an IAS officer. Please suggest me the best course that I can opt for completing my graduation that would be easy and also help me in becoming an IAS Officer. Hi, I am a 12th passed student with 81%. I want to know that can I do B.com and CS both together. Also, I want to know your opinion about CS examinations.Is it easy to clear CS examinations by an average student.What is the scope of doing this course? Please reply, I have already dropped my one year due to financial problems. Hello, I am appearing for 12th boards. I am bit confused to choose a correct course for myself. Please help me to choose a degree course for me as I have a keen interest in management section. I would like to check, if anyone can help me to prepare for the Entrance examination of Culinary Academy of India for the Chef course i.e. Bachelors in Culinary arts. I want to be a chef and not interested in Hotel management.I am looking for some information about the model of the question paper.I have completed 12th last year and did one year food production at Hyderabad. Just prepare as a regular entrance examination where you are tested on General knowledge, current affairs, communication skills and the most important thing in Culinary Academy of India selection process is that there will be group discussion and the personal Interview rounds. Here you have to perform well to get a seat in Culinary Academy of India. I think you are appearing for Three year bachelor in Culinary course. All the best & do well. Alumni of Culinary Academy of India. Hi, I am studying in 12th with commerce stream. I am very confused about my career. Please help me with best career options. Thanks! Hello! I am giving my 12th boards and I want to know everything about BMS. Hi,I am confused to take course after 12th and what is best between CA and B.com please guide. Hi, I have finished my HSC exam in science stream. I am waiting for my 12th result.I know my result will not be good as I haven’t done my best due to mental problems. Now I am a lot better and thinking of persuing further studies.I have lot of interest in management and finance. I’m thinking if BMS is good for me but as I have no background in commerce and I don’t know if it is a better idea. Or is it good to do B.Com or B.Com(hons)first. Please guide me, should I go for commerce stream or not. Hello, I have done B.com(2014) with 76% and M.com(2016) with 76%. Now, I have done a certificate course of tally and one year diploma in computer information technology. What else should I pursue in order to improve my resume and get a good job. I think B.com is best option. Hello,I am pursuing CS. I am in executive level. I have given my attempt.But, I didn’t clear. We have to study more and I have little stamina for preparing for exams. So, I am thinking to quit CS. Is it a good option to switch over to other course. Hi Palak, I can well understand your situation. But, don’t get disheartened. Relax! It’s quite normal for students to appear in multiple attempts while completing such courses and they come out with flying colours. So, if this was your first attempt, you should at least give a try again. You have enrolled for it because you were interested in it, so just give it some more try before giving up.Look for your weak points, where you exactly lagged behind and try overcoming it. But, still if you feel to switch to another course, consider your own interests. Also, if possible try to complete a basic graduation degree along side to help you build a good base. I have just given my board exams. I want to go into Civil Services later on. But, I have a rather sketchy idea of what I should be doing right now. My parents really want me to decide fast. Please guide, Thanks in advance. Hello, I have just given the 12th boards(CBSE) and going to give CPT in June this year. I’m thinking of doing Bachelors in Economics as I want to give CSE (CIVIL SERVICES EXAMINATION). Becoming CA is not my main goal but I just want to give an attempt to it. My main aim is to become an IAS Officer. So, what do you think of this combination? I just want to say that, I’m fully determined and ready to do hard work to achieve success in these courses. Is it possible to get all these things done in coming years and do they have any scope? (As per my combination). What is your opinion about it and can you please suggest some top colleges? If possible, you can suggest other alternatives also. THANK YOU. Nice details, really helpful article for commerce students. Thanks a lot. Hi, my brother in law completed +2 commerce in 2008. Post that he did B.com from EĹLIM university. Right now he is pursuing MBA from KR Manglam University. He is not getting job as no one is considering his B.com valid. We are really confused what to do? Can you help. Hi Isha, We can’t help much in this case. You need to check with the university where your brother in law completed his graduation. Whether it’s a recognised university? Why recruiters are not considering it valid? You should get the answers by contacting the right and concerned person at the said university. Hello, I am very good in academics. I am expecting 95% plus in my 12th standard board exams(ISC).I like Economics but at the same time I am interested in CA also. People say that CA is the most fruitful career in commerce. I am extremely confused about what to do. Actually I suffer from a disorder called “congential nysthagmus”, it simply means bad eyesight. Which can be the best career with great opportunities and pay for people like me? I hope that you would help me out. Apart from this I have a gut feeling that computerized accounting might replace CAs in the future so this might make my degree worthless right? Hi Vikas, You are done with your exams and it seems they have gone quite well! Great! First of all, let me just clarify an important point here, no matter how much computerised this world becomes but manual control is still indispensable. Businesses can’t survive without the help of qualified and trained persons in the accounting and taxation field. You always need efficient human supervision to analyse and interpret what a software is doing. Right! So, computerized accounting is not going to replace CAs anyhow. In fact, with the emergence of new laws and taxes around, the demand for CAs is on the rise. CA is a fruitful career but you get the rewards after putting in immense hard work. Now, coming to your interests, you like economics but look forward to do CA also. CA is a vast field where you shall focus primarily on accounting, taxes, laws etc. Economics shall be just a minute part of it that too at the initial stage only. Further, CA involves regular studies, a lot of patience and consistent efforts. There are as such no regular classes, but students usually get exhausted attending private coaching and preparation of exams. So, be careful while selecting your course. However, if you are determined to do CA just relax and analyse, how well you can manage it and then move in that particular direction. However, if you have keen interest in economics and wish to get a specialised degree in economics, you have other options to explore. You are an intelligent guy, think deeply, discuss with your family and friends and then take the best decision. All the best! Hi, I am a student of 10th standard. I am going to take commerce and after completing my 12th I am planning to go for CA and CS. So, is it a good choice for career or should I go with some other courses. If I go for CA and CS approximately how many yrs would it take for me to complete my studies and get a good job? Can you please guide in this. A wonderful article! This gives all the details that a student normally looks for while deciding for a good career option. Thanks for sharing such in-depth and useful information. I have given my 12th standard exams just now. I am very confused for selecting a proper course that gives me a great job opportunity. I am very interested in designing a product, its price, its label,logo and then selling it in the market etc. i.e. marketing management. In 12th class board project I made a project on marketing management and the board teacher was very impressed with my project . She also told me as a compliment that if I sold my product based on the project made, I’ll be able to take the product to a greater height. According to this, please tell me which course will be the best for me . Nice article! Keep posting such type of informative articles to help students choose best career options after 12th Class and take a good decision. Sir, I have scored 90.2% in my 10th board exams.I don’t like Maths and I am weak at it. Should I take it in 11th and 12th class? Can I do CA or MBA without taking Maths? If I don’t take maths, will I get admission in any college? I stay in Kolkata. I have an option to chosoe business studies instead of Maths. PLEASE REPLY! Hello brother, I would suggest you to take business studies as it is a theory based subject and you will not feel any difficulty in it. Hi, my 11th exams went really bad due to lack of my seriousness towards studies. Is there any chance that I can polish my 11th basics and perform better in 12th class. I really want to get a good percentile in my boards. Therefore, if you could help me out here I would be really glad. Hi, I have just cleared my class 10th exams. I am confused in opting additional subjects with Commerce. I expect to get 92% in 10th class. I also want to know that if I choose Maths then what are the Maths related fields that I can pursue after 12th class. Please guide me. I will wait for your valuable response. Thank you! You want to choose commerce stream. If you are not good in maths, you can choose subject of your interest. Mtahs is related to engineering. This might not be very helpful in commerce. You can take Fine Arts as optional and boost your grade. Very impressive and informative article. Thanks a lot. Hi, I have given my 12th exams. I am a commerce student. i am slightly confused to choose between BBA-MBA (Travel and Tourism)or M.Phil (English). Can you please suggest me which one is better? What are the job opportunities in both these courses? Waiting for a good reply.THANK YOU! Hello, Just now I have given my 12th board exams. So, I am little bit confused about my career. But, I have decided to choose my career in Accounts field only because I like Accounts. So, please can you help me to suggest the career options in accounts field other than CA course. There are different courses which can be chosen to make the best career after 12th commerce. Students can also choose a career after 12th commerce with maths and without maths. There are many courses available to build a good career. Can u suggest me which is the course that I can study as I have just finished my 12th board examination. Now, I have to study further so what can be the best course that I can do that will help me to build a successful career. Can anyone suggest me about Banking and related courses? Hi, I have given boards recently and I am confused as to which course to pursue. I have good attitude and good communication skills. I want to take commerce and I am good in studies. But, I belong to a middle class family. So, which course shall be suitable for me? Please guide. It is a great experience to read your blog. It is great source of information for the confused minds. Thank you for sharing such useful information on commerce courses. It is very helpful for students who want to start a career in commerce. I am currently in 10+2 and I am literally confused which course to pursue.Should I go for B.COM or CA/CS or any other? Please help. Which course to pursue after 10+2 commerce? Please answer. Hi, I have just finished 12th board examination. I want to complete my further studies and do CS. Can you give me suggestion or guidelines for that. I want to get a job fast. How to study and which course to study to have a good career in commerce? Please guide. Hello, I just want to ask you is that does Bachelor in Accounting & Finance come under B.com regular or is it a different course? If it is a different course, then how to fill the form while we go to colleges for admission. I have completed my HSC in commerce field without maths. I am interested in accountancy, finance and especially in IT sector. Can you please suggest me a good course. Hello, I am a student of 12th commerce. I am basically confused which is the best course that I should pursue after completing my 12th standard. If you say about interest, then I want to become a teacher. But, nowadays becoming a teacher isn’t a big profession or you know its normal now to be a teacher. So, I am further unable to decide what to do and which course to opt for. I seriously have no idea what am I going to become as I had to cancel the option of becoming a teacher. I hope that you would understand my problem and look up to it. Kindly suggest so that I can think a bit about it. Which course is best suitable for following fields after 12th standard? I recently passed in 12th commerce board and percentage is 45% only. Which is the best course for me? I am also interested in BCA. Hello, I have recently passed 12th standard with 60% only. What should I do? I think BMS is the best course for me. Can u tell me which college is best for BMS in Mumbai area? Hello, I just passed my 12th and I got 48% only. I am confused to choose between B.com and BAF. Which course should I choose? Please guide. Awesome article with complete info. I am thinking to opt for commerce after 10th but still confused about making a firm decision. I’ve done my 12th studies and now I’m really confused how to go ahead. I’m interested to do air hostess job. So, can you tell me that BMS course will be helpful in pursuing my further studies for air hostess. Hello, My brother-in-law is doing 1 year course for Accounting and GST and he wants to do graduation. Which courses should he prefer like B.Com, B.Com with Taxation or B.Com with Accounting or any other? Please suggest. Can I do B.C.A after 12th commerce? I have heard people saying that B.com is the best course after 12th commerce. Hi, I am doing B.com. and this is my 2nd year. I am also preparing for banking. But, I am a little confused what to do after that.I am not able to find the right guidance. I would be grateful if you can suggest something on this. Hello, I passed class 12 with 84.75% in commerce stream. But, my maths is so weak. My parents and relatives are suggesting me to do CA which requires good mathematics. But, I don’t want to do CA. Please help me, what should I do? Thanks! The given list of career options after 12th commerce is extremely useful. Thanks for sharing it. Hello, I’m a student of class 11 commerce. I’m confused which field should I choose further. Please give some suggestions. Hello, I am a student of class 11th commerce. I’m confused which field should I choose further. Please give some suggestions. Hello, I have taken commerce + computer science. Please suggest some good courses in this field which can give me good career opportunities. Hello,Thanks for the great information for the aspirants who are confused to select the best career options for them after qualifying 12th exams. The above mentioned courses list shall be a great help for students. I have completed my 12th standard. I can’t decide which course to do. Please suggest. Hi, You need to check your interests before taking a decision. Which subjects you like? What you would enjoy doing? Then decide which course to do to build a good career ahead. Excellent article. Very useful and helpful for students to know in detail about different career options. Creative career streams are also gaining traction recently. Hi, I am doing B.com 2nd year. But, I am not comfortable with it. I am loosing interest in this course. I am good at business management. My favourite subject is business management. Please tell me for which courses should I do for my better future. Thank you! Thanks for sharing this great information on career options after 12th. A nice read and good insights on different courses available these days. Nice information! I just liked this list of courses. I feel the simplest and best course after 12th commerce is B.com only. It is the most popular option. Thanks this post has cleared all my doubts on different courses to choose from. A nice collection of courses. Hi, I am an average student. I am 12th pass out with 70% and I am in B.com 2nd year now. I am really confused about which course I should pursue with B.com presently. As before, I had tried for CA but that didn’t work. So, now I am looking forward to do CS. But, as I heard that this course is also tough. So, I am bit scared to register. I always wanted to be a lawyer. So, I am also thinking of doing LLB after my graduation. I am not sure that I am eligible for giving LLB exams before graduation. Can you please suggest a good option. Relax and think what are your interests. Don’t jump into too many courses simultaneously. If you are doing B.com regular it may get difficult to manage too many courses at a stretch. CS does not require any formal classes, I think. But, there’s a training period to be completed. So, just check it doesn’t clash with your regular classes. CA is tougher as compared to CS course. CS is more towards theoretical side. So, if you are good at theoretical subjects it won’t sound tough to you. Actually, I would be appearing for 12th board exams next year. I thought of doing B.com along with ACCA. Is it possible? Please suggest. I am very confused about what should I choose after 12th commerce. On what basis should I choose my course that can help me build a good career? Any suggestions. Hello, I am studying in 11th commerce. Now, I am confused that which course should I prefer after 12th commerce. I knowing that I want to do business after graduation. So, it’s confirmed that I will not do professional courses like CA,CS,etc. So, can you suggest me any course which can be helpful in business field. THANK YOU! A really useful list of courses after class 12th commerce stream. Thanks for giving a brief idea about different courses that a student can do. I know it’s not easy to take a decision. Such information simplifies things and guides about good courses. BJMC stands for Bachelor in journalism and mass communication. It has a vast scope as it is the advanced course which is opted by students. It consists of studying mass media, photography and anchoring. Students can make their career in this field as it has vast opportunities. I am in 11th commerce. I am confused which course to select after 12th standard. Any ideas for it. Commerce is the field which is booming these days. In fact, it has a huge scope and you can look for it! A degree in commerce will help you to start up with firm steps in this growing sector. I have done BBA and now placed in a good digital company. All the commerce students basically do B.com and then M.com etc. most of the time. I don’t want to do this because this is common and I am not in interested in this. I want some unique, special,interesting and best course for graduation. Can we take marketing field after 12th commerce? If yes, then is it benefit from professional side? Hello, I am currently giving my 12th board exams. I’m a commerce with maths student. I really regret taking maths because I am average at it. And, now it’s decreasing my grades. I’m thinking of doing BMS from DU or IP University. But, due to my low interest in Maths I’m not sure if BMS is the best option to opt for. Any suggestion you can provide for my situation that would be very helpful. Hey there! I’m a CBSE commerce student. I’m really confused about my future. I like hotel management and like to be a chef in future at the same time. I have interest in other platforms. Really, I’m looking for a job that is not common but has a high scope. Please tell me that how can I plan my future in the best way. Please explain the best courses I can prefer. Hi Ayush, Its quite normal to get confused while deciding the right career option for yourself. Firstly, you need to relax and think, What are your real interests? Which are your favourite subjects? What you really enjoy doing and pursuing as a career option? Do you want to get into a regular career field or are you thinking to opt for a creative career alternative? Once you get the answers to these queries, it shall become easy for you to decide a good course. You are done with your board exams so you still have some time to take the correct decision. You can discuss with your family and teachers about various career prospects. Choose the one that fits your interests. All the best! Excellent article. Thanks for the information. It was very helpful for me. I just want to ask, I have decided to do BMS course. But, the question arises is there any compulsion of having Maths subject in HSC for doing this course? Please let me know. Well explained! I think B.Com Honours will be the best for people who are good in calculations. Hi, my son has given 12th commerce stream exam. We belong to a poor family. We are confused about his future. Please tell us what course should we choose. I’m an average student. I have scored 68% in my 10th board exams in 2018 and I’m not sure that I can be successful in CA. But, I’m interested in this course a lot. Can you give me some suggestions please. Hi, My daughter has given her 12th std (Commerce) exams and awaiting results. I checked your website around the topic “best course after 12th commerce”. I agree that CA is the best professional course. Also, as you had rightly mentioned that it does take lot of hard work to complete. Since, this is extremely tough and needs ones consistent hard work, can you suggest an alternate professional course. I came across an advertisement where there is an institute where they train students on CMA, CIA and CPA (an integrated course). What’s your take on this? Will this be a good alternate to CA? I am not sure about these certifications. Please let me know your thoughts at the earliest. Hi, Yes, CA is a bit difficult course. However, CMA and CPA together might also seem a bit difficult to manage. Rest, it depends on the calibre of the student. I don’t know what advertisement you are talking about. But, be careful and go with genuine institutes only. I think this might be a coaching institute that you are referring. Professional courses like CA,CS,CMA,CPA have their own professional bodies that manage them. These are good certifications. You can directly enrol with them without any intermediary. Hey, I would like to add further. A combination of B.com with any of these courses like CA, CS, CMA is quite manageable. While enrolling for a professional course, I feel one should complete a basic Bachelors degree alongside. With lot of uncertainity around finishing CA and lesser students clearing in first attempt (though passing % is around 10%-12%), CPA stands as an alternate. The number of papers is less. I think the pass % is around 40%-45%. What do you think? Yes, I too agree that a Bachelor’s degree is a ‘must to have’ sort. Moreover, to do CMA (US) the candidate should be pursuing a bachelor’s degree. I think for CPA also, there needs to be a graduation minimum to become eligible to take up the exams. Yes.. All the three (CMA, CIA & CPA) are from the US. They have got their own certification bodies as we have ICAI for CA here. The combination of these courses seems exciting. It should not be a difficult proposition to do all the three together, if properly programmed. Also, there is a bilateral agreement between our CWA institute and IMA (US). Though the papers in the US certifications seem minimal, they are not easy courses. It depends on the commitment shown by the student. But, once committed, he/she can finish the papers with genuine efforts. CPA is an international certification and holds more value abroad. In India, CA is the topmost accounting qualification. Or if one has an MBA degree from a reputed institute this can further strengthen the profile. Thanks Kartik. Because of globalization aren’t MNCs hiring CPAs now for their outsourced work? Big 4s especially are looking for CPA professionals. CPA and other such US certifications also are very much valued by the fast increasing MNCs & the Big Four Firms in India. And, of course MBAs from an institute of high repute can add immense value to the profile. I read your article it is very useful. Thank you so much for helping us with your excellent article. I have given exam of class 10th this year from ICSE board. I am thinking to take commerce in class 11th. If I will do my graduation and post graduation in India then will I be able to get job in Japan? I’ll look forward for your answer. Hi, Is there any specific reason to look for a job in Japan? I mean I haven’t heard many people from India going there after higher studies. The education pattern in India is quite extensive. I don’t think you might face any issue while moving to another country. But, you may have to do some additional course in that specific country like Japan you are saying. There may be language differences as well. Actually, Japanese is their first language. But, if you know English, you can overcome that also. Although, I am not sure English is a widely spoken language there or not. I think BBA is best for me after 12th commerce. But, I am a bit confused. « 7 Best Books on Mutual funds Investing!